Most Americans are led to believe that their country is the richest and the best in the world. It is a land of milk and honey and of limitless opportunities. There is little doubt that the US has enormous wealth; with a GDP of $17 trillion, it is by far the richest country in the world but is this wealth fairly distributed? Most Americans are led to believe that their country is the richest and the best in the world. It is a land of milk and honey and of limitless opportunities. There is little doubt that the US has enormous wealth; with a GDP of $17 trillion, it is by far the richest country in the world but is this wealth fairly distributed? While propaganda on television drums this into the heads of people that America is the best, the richest and the brightest, the ground reality is very different. Statistics released by the US Department of Agriculture (USDA) show that nearly 15% of US households, 17.4 million families or about 50 million people, were too poor to buy adequate food last year. And at least one million children were missing meals on a regular basis, according to the USDA study. Other reports say that there are now 50 million people living in poverty with some 40 million children without medical insurance or proper medical care. Barack Obama, an African-American, may be occupying the White House but the overwhelming majority of America’s poor continue to be African-American. They also make up a disproportionate number of the prison population. Poverty levels have been steadily rising over the past decade but in the last three years, these have escalated alarmingly. The USDA uses the term “food insecure” to describe those that receive food stamps to supplement their food intake because they are unable to purchase it. This number has more than tripled since 2006. 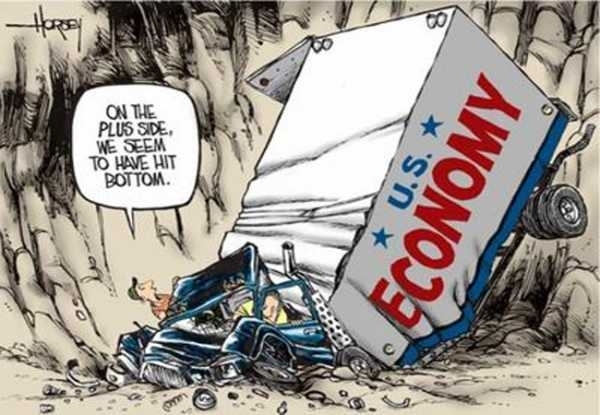 And this was even before the current economic crisis that erupted in October 2008 when then US President George Bush sent two of his top aides, Treasury Secretary Henry Paulson and head of the Federal Reserve Bank, Ben Bernanke to Congress to demand a $750 billion bailout package for failing banks. A select group of congressmen was told that either they accept this proposal without any conditions or Bush would have to declare martial law! The congressmen caved in. The banks were bailed out for losing money on bad debts accumulated as a result of Ponzi schemes called “derivatives” while the victims of these scams were left to fend for themselves. Tens of thousands of people lost their homes because they could not afford payment on mortgages. They lost their homes and their jobs and were forced to live in tents. Not one banker has been sent to jail for indulging in financial rackets. If an average person defaults on his loan or mortgage he loses not only his possessions — homes, other securities — but might also end up in jail. This is what is called “freedom” in America, the land of opportunities. 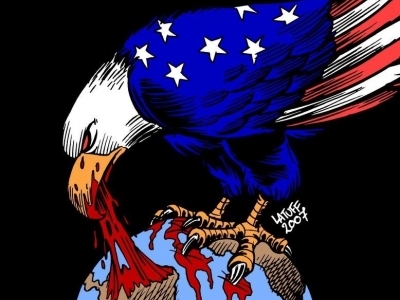 There are obviously plenty of opportunities for crooks and criminals yet the overwhelming majority still believes they live in the best country in the world and most still willingly send their children to die in wars for cigar-chomping corporate crooks. For people to live in tents, not as a vacation but out of necessity, is a more recent phenomenon. The official US unemployment figure stands at around 10%. The true figure is much higher — around 18% — because the government determines the unemployment rate from the number of people collecting umemployment compensation, which only lasts for one year. If anyone has been unemployed longer than a year, when he is no longer eligible to collect umemployment, then he is not counted. In fact, among African-American youth between the ages of 18–24, this figure stands at a staggering 30%. It is widely accepted that many people have stopped looking for work out of frustration. And there is no safety net for them either. The number of homeless people has also risen alarmingly. When the USDA conducted its study, it found that most people were reluctant to admit they had a problem putting food on the table, particularly among those with children. “Food insecurity” was calculated from survey questions about skipping meals or running out of food stamps, combined with comparisons of income and food prices. This is all the more surprising since America is the largest producer of agricultural and food products on earth. The basic reason is lack of money. While America’s official poverty numbers are estimated at 50 million people, the parameters used for determining poverty levels grossly underestimate the income needed for basic necessities. Those considered food-secure spend a massive 33% more on food than the average food-insecure household of the same size and composition. When there is little or no income, families are forced to make critical choices. Often, mothers of young children have to go without food because children are given priority but even this is not adequate protection. Very frequently, there is not enough money to buy food even for children. Malnutrition is becoming a phenomenon in the land of milk and honey. The US media regularly focuses attention on starving children in Africa. Starvation and Africa have become synonymous in the minds of most people, thanks to this incessant propaganda. Many western aid organizations, especially churches use images of starving children to solicit funds. That most of this money never gets to those in whose name it is solicited is a different question. In the early 1980s, Jerry Falwell used the famine in Ethiopia to raise an estimated $3 million for his organization called the “Moral Majority.” An audit of his activities discovered that he had sent only $200,000 to the starving children in Ethiopia; the rest was consumed by Falwell and his cronies. Falwell represented no “majority”, and there was nothing “moral” about his activities. He is dead and gone but his activities reflect the kind of scams run by many churches in the US. The number of Americans receiving food stamps under the Supplemental Nutrition Assistance Program (SNAP) has risen to 42.4 million. Another one million children received free or subsidized school lunches daily, while some 400,000 pregnant women and nursing mothers received milk, butter, eggs and other food under the WIC program. All told, one quarter of US households have at least one person receiving food stamps or other food aid. However, 43% of food-insecure households were not participating in any of these three programs. Despite these grim statistics, America’s corporate elite want to wage more wars costing trillions of dollars and the Republican-controlled congress wants to slash funding for food stamp programs because they insist people are poor because they are “lazy”. They would rather slash $700 billion in taxes for their hard-working corporate friends that finance their election campaigns. Corporate executives have to be compensated somehow, especially if they give so generously to congressional election campaigns. If the poor cannot afford bread, they can always eat cake!